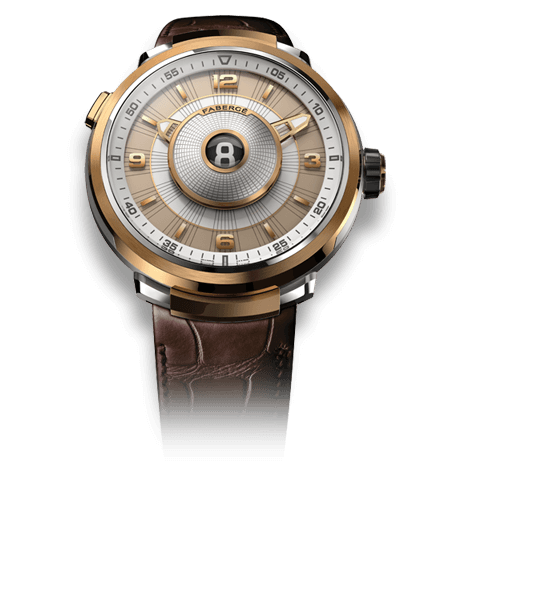 Lucerne-based Chronoswiss is once again one of the 50 watch brands taking part in this year’s edition of Only Watch by Christie’s, which will be held in Geneva on November 11, 2017, and, as was to be expected, it is a beautifully artistic twist on the Flying Regulator, the Swiss brand’s signature watch model. Thanks to its stunning color combination, the picture-perfect Flying Regulator is set to raise awareness for Duchenne muscular dystrophy. For those not familiar with the history of Chronoswiss, it was back in 1987 when talented watchmaker Gerd-Rüdiger Lang was the first to introduce a so-called regulator dial wristwatch into serial production. “Not a big deal,” a philistine might think, but actually it truly was. Originally developed in the nineteenth century, a regulator was a precision pendulum clock that the clock maker used as a reference for all the other clocks and timekeepers he was working on. The regulators were the most precise timekeepers in their day days: a true regulator dial vertically sandwiches the large central minute hand between the small dials for hours (top) and seconds (bottom), which means that every hour on the hour the minute and second hands both point up and line up. At midnight all three hands line up, so it’s very easy to use as a reference. 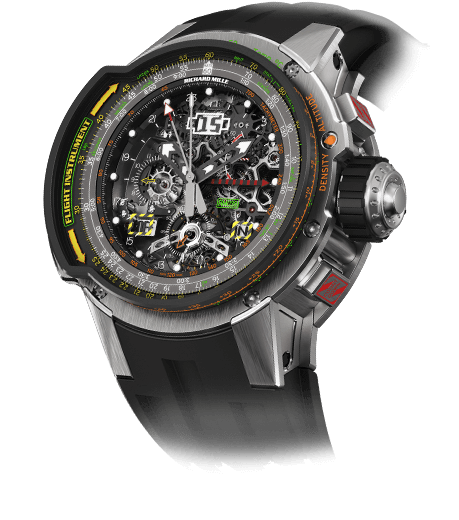 Lang, a passionate watchmaker and enthusiast of mechanics in general, recognized what the quartz crisis times might bring. 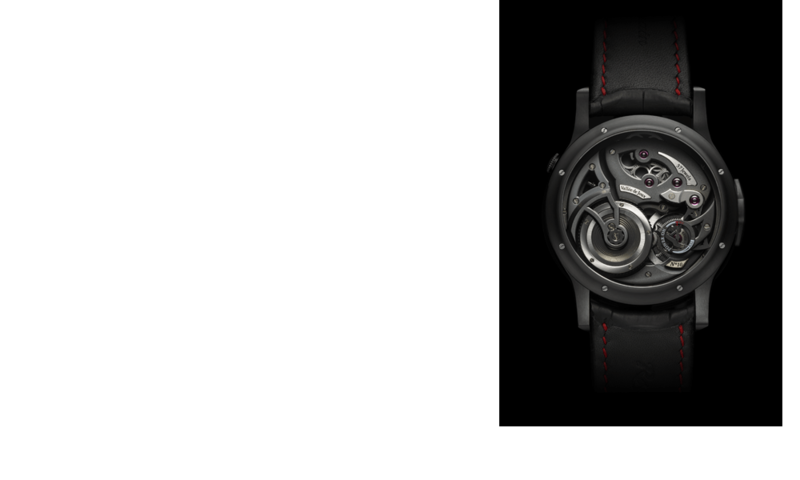 Seen from today’s perspective, his idea of transposing an ancient display into a modern watch and launching a new mechanical watch brand deeply rooted in the noble traditions of Swiss horology may appear progressive and forward-thinking – even if the entirety of the concept could be found in the annals of watch history. The brand soon became one of the handful of pioneering watchmakers in the renaissance of high-quality mechanical wristwatches, and not only in Germany. Lang is also credited with introducing sapphire crystal to the case back of a mechanical watch in order to clearly display the inner mechanical workings the watchmaker was so passionate about. One of these certainly was the original Régulateur, an iconic Chronoswiss model that has appeared in a variety of variations over the last 30 years: first with manual winding, soon after as an automatic watch, in chronograph form (Chronoscope), in a rectangular case (Régulateur Rectangulaire), with a tourbillon (Régulateur à Tourbillon), in limited editions (Régulateur 24, Régulateur 30), and even as a daring retro pocket watch (Grand Régulateur special edition with bayonet lock). Chronoswiss’s use of the regulator dial set a new trend in watchmaking with many new regulator wristwatches appearing from other makers in its wake. As the signature model, the Regulator successfully carved a niche for Chronoswiss and remained a top priority even after the change of ownership in 2012, when Oliver and Eva Ebstein bought the company from Lang and moved it from Munich, Germany to Lucerne, Switzerland. “The Regulator stands for Chronoswiss. It is the invention of Chronoswiss as a wristwatch and sets the seal on our ‘DNA’,” says Ebstein, who has guided the company ever further into Swiss Made territory. Consequently, in 2016 Chronoswiss opened a new chapter in the story of its bestseller by “giving wings” to the clear dial layout with a floating dial construction.  The striking effect of the Flying Regulator stems from dial components that raise the hour and second subdial displays above the guilloché pattern of the base dial. From an artistic point of view, I find the Flying Regulator Red Passion to be one of the most intriguing contributions to Only Watch 2017 as it features an outstandingly detailed guilloche dial that once again highlights the noble traditions of Swiss craftsmanship so dear to Chronoswiss. In Chronoswiss’s own Artist’s Workshop, part of the Lucerne-based “House of Chronoswiss” opened in 2014, a craftsman manufactures the artistic treasures representing excellence and authenticity; the work done by hand ensures that no two watches are exactly alike. While the type of guilloche we chiefly see today is a hobnail pattern (clous de Paris), Chronoswiss has created a unique, filigreed pattern for the Flying Regulator that further enhances the three-dimensional effect of the dial: a “wicker” guilloche that seems to visually change with the eye’s varying perspectives. On closer examination, the tiny graphic elements inspired by the guilloche “wickerwork” create a mesmerizing impression almost like the optical illusions of some of graphic artist M.C. Escher’s masterpieces such as the never-ending staircases. The viewer might have a hard time taking his or her eyes off it. This opulent, alluring decor makes an ideal backdrop for the flying subdials that are “staged” above the dial. 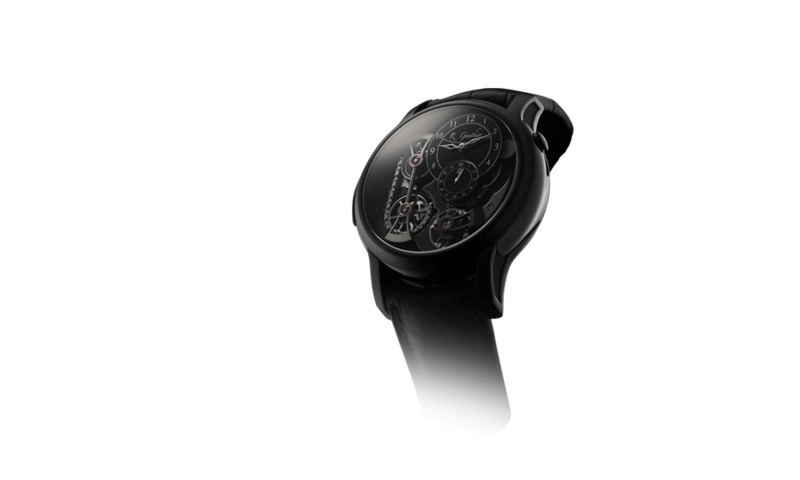 The beauty of this timepiece is further enhanced by its intense expressive color composition: the dial, numbers, and hands stand out in flaming red against the deep black stainless steel case coated with ultra-hard DLC. And two essential elements not to be missed on a typical Chronoswiss are of course included here: the oignon-shaped crown and the knurling on the bezel. 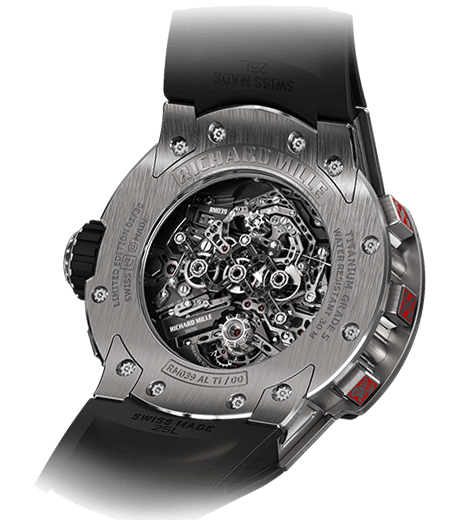 A look through the sapphire crystal pane on the case back reveals the excellent aesthetics of automatic Caliber C.122, which in this unique version is outfitted with a skeletonized rotor that repeats the coral-red hue from the dial. It rotates above a circular-grained plate and finely finished bridges with Geneva stripes and circular graining. The powerful character of the watch is complemented by a special strap that perfectly matches the colors of the dial and case. Handcrafted from Louisiana alligator skin and dyed red with black elements cleverly worked into it, this component is the proverbial icing on the cake. The successful bidder also receives a special travel case lined with bright red leather matching the color theme. 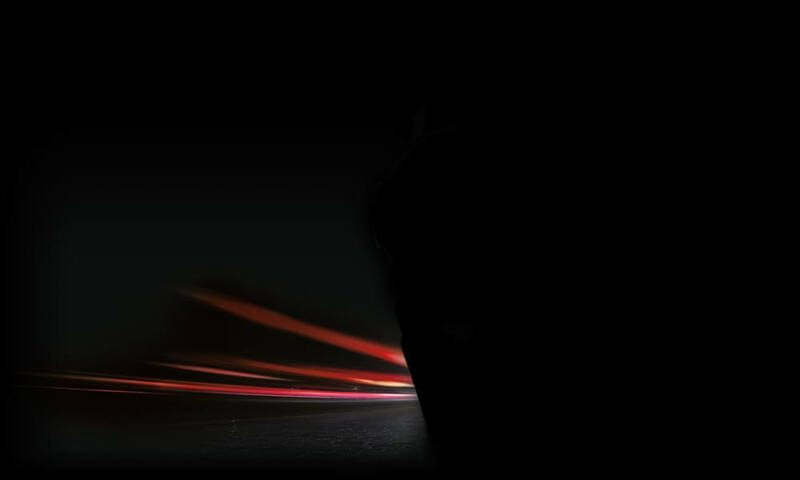 For more information, please visit www.chronoswiss.com and/or www.onlywatch.com/the-watches/chronoswiss. Hublot Big Bang Unico Sapphire Usain Bolt Unique Piece For Only Watch 2017: Feel The Need For SPEEEED! I really like the red face of this watch it really pops. Well designed.